During the summer, dinner at our home means salad or something grilled, and sometimes both. I love a good, hearty salad to fill me up after a long day of work (or swimming). 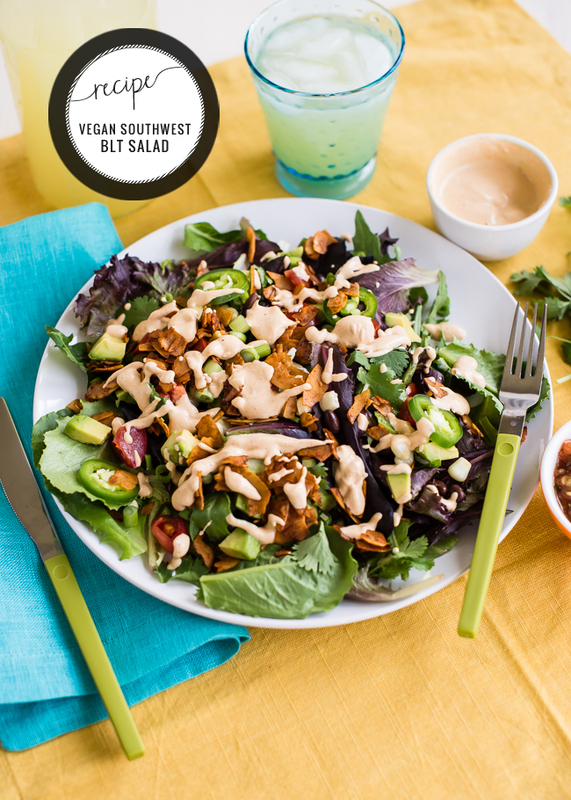 This is a vegan, Southwest and salad take on a classic BLT sandwich. Instead of bacon, I used coconut bacon, which is pretty amazing. If you’re not vegan, by all means use the real thing. I just think this adds a little something unexpected and special to the salad. 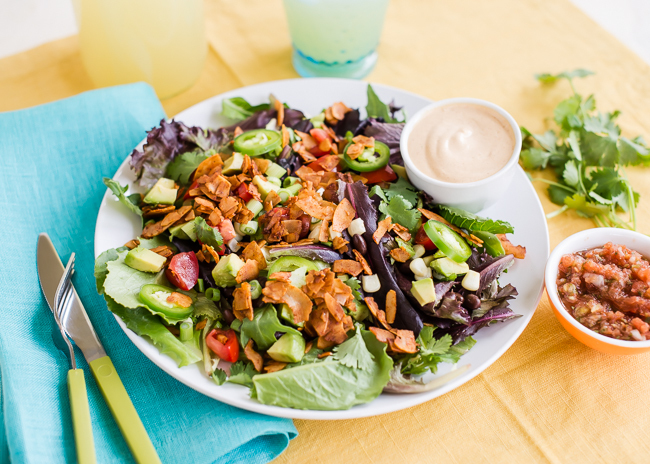 The dressing is also dairy-free, vegan and 100% amazing! 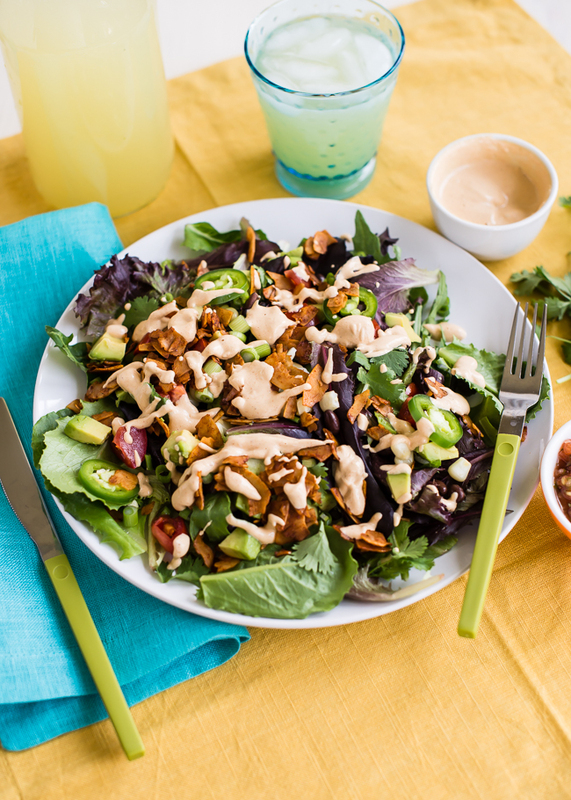 This salad goes a long way towards fitting in all those veggies and good fats we need in our day. The dressing really is delicious. It’s made with a cashew cream base with chili powder, cumin, and plenty of fresh lime juice. I served some spicy homemade salsa on the side, too, because salsa! 🙂 I think a good salad has to have a balance of flavors and textures, and this salad has just that – crunchy, creamy, sweet, spicy and savory. It would be a great salad to take to a summer BBQ or for a luncheon with the girls. A healthy Southwest twist on the classic BLT sandwich. 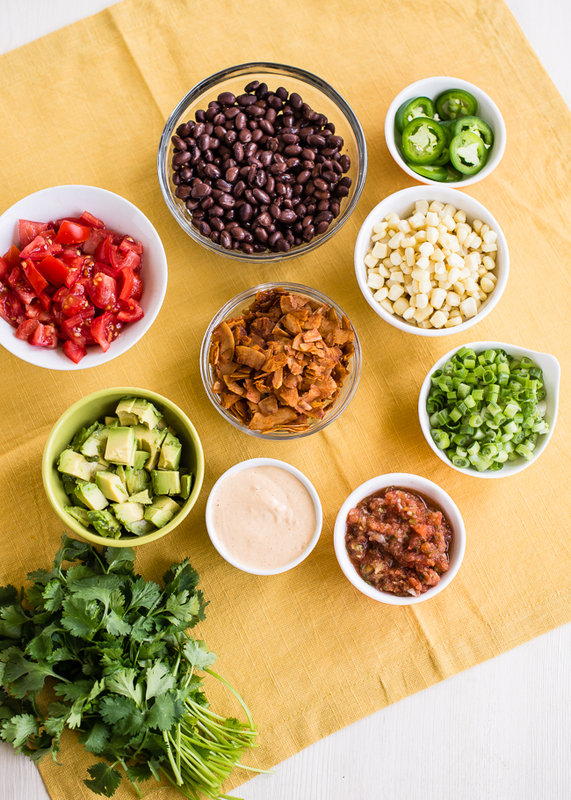 Prepare dressing: Place all of the ingredients in a high speed blender or food processor. Puree until smooth. Add a little more water, if necessary, to reach the desired consistency. Taste and adjust seasonings, if needed. Refrigerate until ready to use. To assemble salads: Divide the baby lettuce mix between six large dinner plates, or in a very large, shallow bowl. Top with the remaining ingredients. Serve with the dressing on the side. -The cashews can be soaked in a bowl of water overnight or for several hours. Rinse and drain well, then proceed with the recipe.